Participated in 'Busan VR Cluster Pavilion' located at BTB hall of 'G-STAR 2016', HandMade Game became famous with the puzzle game, 'Rooms' series. As well as the development of puzzle games, it extended its range to VR games and released 'Rooms: The Unsolvable Puzzle' in VR version through Steam and Oculus. Also, the release of ‘CRANGA! : Harbor Frenzy’ in a variety of VR platforms is in preparation. "HandMade Game is trying to present a unique and funny game rather than a technically great game. Technically great games are good, but we want to be remembered by many people that HandMade Game develops unique games through the features based on our ideas." 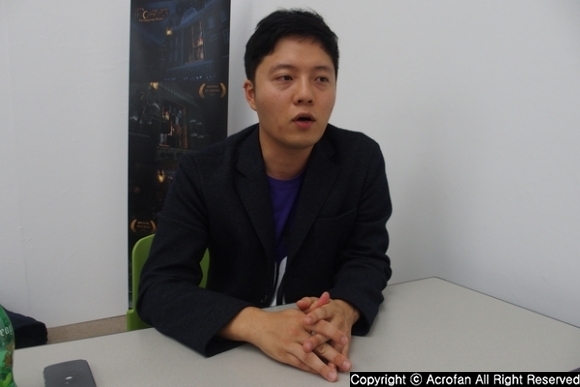 Kim Jong-hwa, a representative of HandMade Game, introduced that he has been developing games with the idea of presenting a unique and funny game rather than a game with high level of technologies. Based on the idea, he said that he has long concerned for ‘CRANGA! : Harbor Frenzy,’ which will soon be released, as well as ‘Rooms’ series about what kind of fun he could give. As you can see from the title ‘CRANGA,’ which combined the words ‘crane’ and ‘jenga,’ and subtitle ‘Harbor Frenzy,’ ‘CRANGA! : Harbor Frenzy’ is a large-scale jenga game playing with cranes and containers stacked on the harbor. Its biggest feature is that, as the game is developed for VR platforms, it is able to look at jenga tower from various positions and make strategy by using 'positional tracking' technology, which recognizes head movement. Particularly, it was introduced during 'G-STAR 2016' that it will be served not only for PC VR but also for Sony Interactive Entertainment's PlayStation VR. This is because the company thought that PlayStation VR would be the biggest market in premium VR markets. 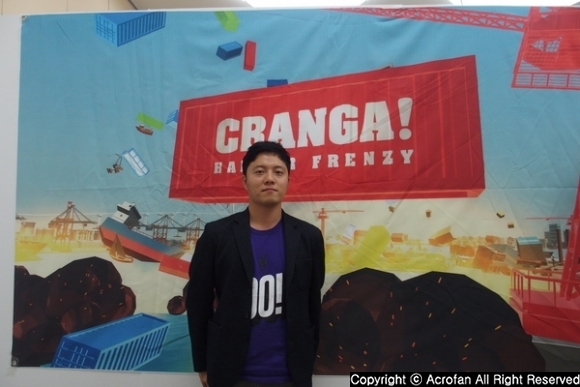 About reason of the development of ‘CRANGA! 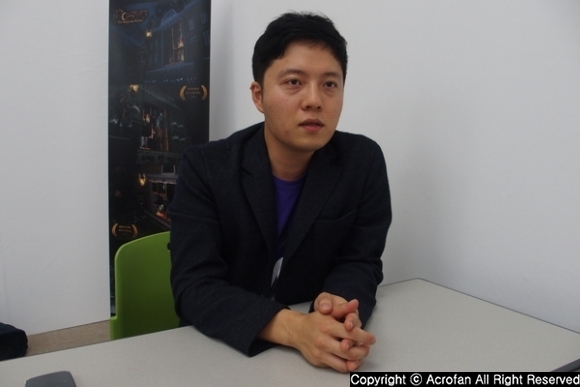 : Harbor Frenzy,’ Kim Jong-hwa explained, “The goal was to create a VR game that could be enjoyed by many people, and we had a game that people can enjoy the party and play alternately at the same time in mind during development. Of course, it also includes factors such as competing through network and challenging for higher points." He also said that he realized the game was a distinct possibility as he sees his father enjoyed playing it when he created the prototype. ▲ 'CRANGA! : Harbor Frenzy' was developed with the goal of playing a game while enjoying a party. Then, what is the charm of VR game that Kim Jong-hwa thinks? He explained that the elements that were not used well in existing games could be used to create new experiences. Moreover, by using 'Stereoscopic 3D' technology, '3D Sound' technology as well as 'positional tracking' technology, and controllers that suggest various controlling methods, it offers new fun, which is different from the existing games. For future plans and dreams, he said that he wants to develop a casual VR game that anyone can enjoy. Also, he wants to develop a space creation VR game called 'Space Maestro,' which was developed as a graduation work at college, into a consumer version and release it. 'Space Maestro' has the story that the user collects clouds from space to make stars, and that the stars become the sound of musical instruments and the user's galaxies are completed into a single music. Kim Jong-hwa expressed his willingness to develop more advanced VR games, and said that the development of VR games that he is currently doing can be called as a preparation stage for developing 'Space Maestro'. At the end of the interview, he said that he wants the company to be remembered by users as a studio that creates a unique game that will not come out of Korea. In addition, he said, "As it is different from other, I think it's more meaningful to me. I look forward to your continued interest in the journey of HandMade games." ▲ He said he wants the company to be remembered as a studio with more meaning since it is different from others.